Rabbits are a treasured source of companionship, entertainment, and—if you’re living most anywhere besides the U.S.—food. 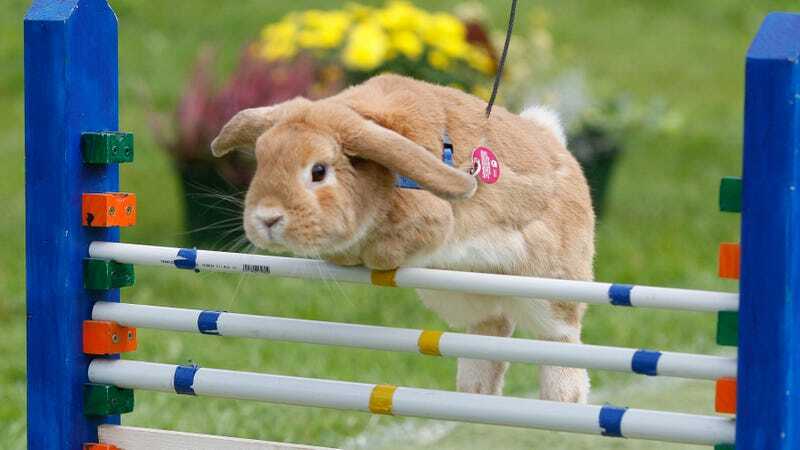 But a new analysis published Wednesday in Cell Press Reviews suggests that whether you turn to folk tales or DNA, there’s no easy way to tell when rabbits actually became part of our domesticated stable. Researchers in the U.K. and France examined the historical, anatomical, and genetic evidence surrounding the domestication of the European rabbit, and found completely contradictory and even sometimes plainly false estimates. The popular story goes that these rabbits were first domesticated in the 6th century by French monks, following a decree by Pope Gregory the Great that newborn or fetal rabbits (then called laurices) were considered aquatic in the eyes of God. This meant Christians could safely eat rabbit during Lent, when meat is otherwise prohibited. This claim was first made in the 1930s by German zoologists, who cited a 6th century manuscript describing the practice, and it has been endlessly repeated by scientists ever since. The only problem is that it isn’t true. When the researchers dug back into the history books, they found a glaring error. While there’s concrete documentary evidence showing Romans kept and ate wild rabbits as early as the 1st century, there’s absolutely no record of Pope Gregory the Great ever giving the go-ahead to eating rabbits during Lent, nor that he thought they were some sort of seafood. The miscited manuscript actually concerns an anecdote told by a historian and saint who also lived during that time, named Gregory of Tours. In it, he mentions a single person who often ate baby rabbits during Lent, but not in any sort of positive light—the man dies from illness, seemingly cursed by God for trying to sack a city where the Church had held someone under their protection. They also reviewed research on the genomes of modern day domesticated and wild rabbits in France, the birthplace of the European rabbit. They looked at the rate of mutation in both groups, which are used as a sort of molecular clock to determine when their genetic lineages first split off. According to that data, there was a clear divergence that took place among its ancestors sometime between 17,200 and 12,200 years ago. But around that time, dogs were the only animal humans might have even started to domesticate, meaning the split-off was likely triggered by the changing natural environment, like the end of the last major ice age, rather than any human influence. It also suggests that only later did a sub-population of rabbits as we know them actually become domesticated, but their genes don’t provide any clear-cut evidence on when that might have happened. Before and after medieval times, rabbits were bred and transported by people throughout the globe to be used as food and eventually clothing. That’s normally a good sign of domestication, but human-bred rabbits often escaped and mated with rabbits in the wild, muddling the picture further. The anatomical research, meanwhile, suggests the skeletal shape of maintained rabbit populations only started to change after the 18th century, when people began to keep them as pets. Near as the researchers can tell, rabbits were certainly domesticated in France, likely by monks, maybe starting around the 12th century. But rather than pointing to any hard and fast date, they say it’s better to think of rabbit domestication as a long journey, with plenty of pit stops along the way. It’s only our need for a satisfying story that makes us eager to believe otherwise. Building on the lessons they’ve learned from their rabbit expedition, Larson and his team next hope to explore the history behind other domesticated species. And they expect to find similarly complex answers.